Business Career Services (BCS) acts as a major support tool for business students. They can take advantage of many different opportunities that the BCS offers, including attending business career fairs, meeting with an employer for a mock interview, or improving a resume or cover letter with staff. 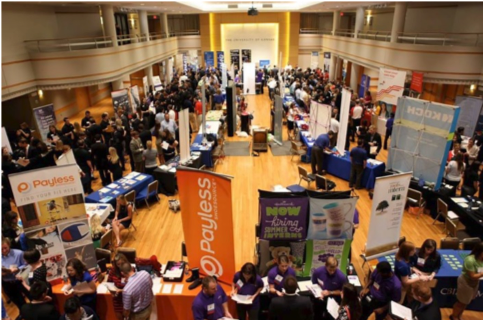 At the KU Business Career Fair, hundreds of students connect with employers. Once a semester, BCS invites employers looking to give business majors internship or employment opportunities to the Business Career Fair. While most internships are provided to juniors, some are given to sophomores, and either way, it’s a great networking event. In fact, I recently had an interview with Northwestern Mutual. Although I’m only a sophomore, I connected with them at the fair, mentioned my involvement on campus, and provided them with a resume. They contacted me soon after to have an initial interview to learn more about me. I now have a chance to get this internship, and the career fair put me in a position to further my relationship with the company and possibly have a future with them. BCS provides students with both the tools and opportunities to make the most out of our time with employers. BCS also provides students the opportunity to participate in mock interviews. Real employers from real companies conduct these interviews for any interested student. BCS opens a time frame to reserve a spot for an interview, and students can choose a specific date, time, and company of their liking. I recently participated in a mock interview with a representative from Black & Veatch. In the interview, they asked me common situational questions and even noted my answers. At the end, they evaluated my overall interviewing performance and gave me feedback. They provided many tips to use in the future to improve my skills and technique. Using the BCS to have a mock interview has helped me get exposure, practice and confidence. Resumes and cover letters are difficult to create, but BCS will help improve them both to showcase any skills and experiences to create a top-level recruiting document. Whether you don’t know where to start, find yourself stuck in the middle, or need help making updates, you can set up an appointment with a knowledgeable and experienced member of the BCS staff. They will give aid, feedback, and support at any stage of the process. In fact, I sent mine to them and they commented on the areas I should fix to have a more effective resume. They selflessly helped increase my chances of future employment opportunities from this process. Learn more about what the BCS has to offer, as well as important upcoming dates and events, here. Stories about the students, alumni, faculty and staff of the University of Kansas School of Business.